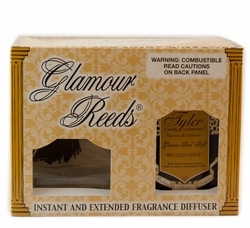 Tyler Candle Company Reed Diffuser Kits feature a large molded glass diffuser, high quality reeds, a bottle of Tyler Reed Diffuser Oil all in a luxurious stylish box. These exceptional sets make a stunning statement for any home and make incredible gifts. Innocent, sweet, playful & always truly genuine!!! Raw vanilla, bergamont, Sicilian orange, raspberry, fig leaves, Lily of the Valley, cotton candy, must, ended with woody notes! A warm and complex fragrance overflowing with delicious fruits and rich florals. 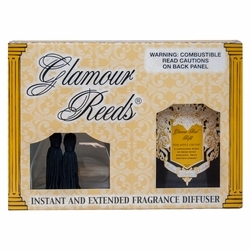 Rich aromatic chocolate and amber complete this luscious blend! An invigorating, fresh fragrance. Spicy, sporty, original, and truly unforgettable! Notes of sandalwood blend with ambergris, violet leaves, French verbena, and Florentine iris to create the ultimate aromasensory experience! Lily of the valley intertwined with citrus and rose. Very dramatic and overdone! Bursting with the medley of currant & grapefruit. A dash of green undertones add an opulent twist! Firmly grounded with confidence!